This entry was posted in Denmark Denmark Immigration and tagged Danish danish visa Denmark Denmark Immigration Denmark PR Denmark Visa Green Card Settle in Denmark on March 25, 2015 by Blog Author. Denmark is a country which is located in Northern Europe. This beautiful country is full of tourist places of interest, enthralling cities and picturesque landscapes which offer a panoramic view of nature. People are attracted to visit the nation, as they are aware of the fact that it is a very warm and friendly nation which welcomes immigrants irrespective of their nationalities. Individuals looking to migrate to Denmark usually do so for the sake of studies or for better employment opportunities. 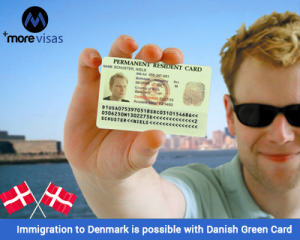 Immigration Denmark is possible with a Denmark Green Card. Migrating to Denmark is a very profitable and lucrative prospect for skilled workers who wish to settle in the country. For this, the applicant needs to possess a Danish Green Card. This is based on a points system under various categories like educational qualifications, language skills and adaptability. The Danish Green Card is a work permit which allows you to live as well as work in Denmark. If you secure a residence permit under this scheme, you do not require separate work permit. A residence permit allows you to carry out both, paid or unpaid work, but it does not allow the applicants to carry businesses in the country. Within the first year of being granted a residence permit, you must have earned a minimum of DKK 50,000 in Denmark. Educational qualifications– A maximum of 130 points is awarded under this heading. Language skills– You must be proficient either in English, German, Swedish, Danish or German. This category can fetch you a total of 40 points. Adaptability– 15 points are allotted for a person’s ability to adapt to the surroundings of the Danish country. The Denmark Green Card is valid for the total time duration of two years, after which one can apply for an extension of three years. During this time, you can bring your dependents to Denmark while you apply for Denmark permanent residence which can easily be obtained, provided you are a Danish Green Card holder. If you are interested to migrate Denmark, please provide your contact details at MoreVisas Enquiry Form, so one of our visa expert will approach you soon.